A chemical peel is a procedure given to help improve the surface texture and appearance of the skin. Most often performed on facial areas, the chemical solutions used can be tailored to meet the client’s needs. It is most commonly performed for cosmetic reasons, aiming to reduce fine lines, wrinkles, sun damage and blemishes and scarring. There are different types of chemical peels, each using a different strength formula, acting on the different layers of the skin. During a light peel, the chemical is applied to a freshly cleansed face and left to work for a few minutes. It is then washed off and a neutralising agent is applied. During a more intensive treatment, local anaesthetic or sedation may be offered as the stinging experienced during the procedure can be quite intense. As before the chemical is applied and left to work; the period of time depends on the chemical used and the desired effect.With most peels, the procedure will have to be repeated at regular intervals to maintain the effect. This can be a costly practice and consideration to this factor should be given before a peel is purchased. If only a superficial peel has been used, results can be almost instant and the skin can appear fresher and younger looking. Redness may occur and slight abrasion and flaking of the skin may continue for a few days. With deeper peels, the face will appear red, sore and tight for a while until the skin has peeled off. This can take several days to achieve, and the redness may last for a few weeks. As with any procedure it is important to research the practitioner and company offering the service. Always ensure the person had received training and ask to see certificates if available. This may require some research and it is advised that a reputable company is used rather than an advert in a local paper to ensure the safest package and provisions are offered. There a few risks associated with light chemical peels which aim to address problems on the superficial layers of the skin. There is always a chance of having an allergic reaction to the chemicals, and some practitioners will insist on performing as skin test first. If deeper tissues are to be concentrated on, the risks increase a little. There is always the possibility that skin pigmentation will be affected and redness or indeed pale areas may occur. This may last a long time or even permanently. Some people have reported brown spots appearing on the skin, this can be treated using other agents and may not be a permanent problem. Swelling is a risk with deeper peels, and clients are often advised to expect this and that a feeling of being generally unwell may happen during the first few days after the peel. 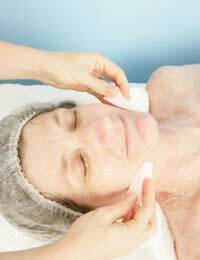 Chemical peels are a generally safe way of rejuvenating the facial skin. Although it can be uncomfortable, the results can be quite good and many people are satisfied with the result. Thorough research should be done before a peel is sought regarding the person performing the procedure and regarding the chemicals used and of what to expect.